Background: Traumatic tympanic membrane (TM) perforations may arise from instruments such as cotton swabs, bobby pins, and sticks, skull fractures, acid burns and welding or metal working slag burns. Pressure induced perforations can occur after loud noise and explosions, open palm trauma (slapping), or changes in ambient pressure that occurs during flying and underwater diving. In case of traumatic perforation, some observation time is recommended before surgical intervention. In the recent years, various substances like hyaluronic acid, growth factors, pentoxyfyline and heparin were used for treating TM perforations. Objective: To assess effectiveness of topical heparin in healing of traumatic TM perforations. Materials and Methods: We studied 73 patients of age group 20-35 having traumatic TM perforations due to various injuries and present to our clinic within one week after injury. These patients where put in two groups, control group which contained 36 patients, and study group which contained 37 patients. Control group patients where treated with systemic antibiotics and nasal decongestants where as study group patients where treated in addition to systemic antibiotics and nasal decongestants by topical heparin. Follow-up was done for period of 21 days and improvement in time of healing was compared. Results: In our study, there was statistically significant improvement (P<0.05) in spead of healing in study group after 3, 7, 14 and 21 days of treatment when treatment was started within 3 days of trauma. Conclusion: The present study suggest that topical heparin has significant role in healing of traumatic TM perforations, especially when used within 3 days of injury. The traumatic tympanic membrane (TM) perforation is a common condition that most patients can be self-healing. But, the healing time is uncertain and hearing loss or tinnitus can brought about psychological stress to patients during healing, once secondary infection can lead to permanent TM perforation. ,,, These issues warrant investigation into non-surgical alternatives to conservative treatment. Heparin as an anticoagulant entered the clinical more than 80 years ago, recently, more and more biological activity of heparin was found, and its role in normal wound healing is well documented. The present study is done to evaluate the role of topical heparin in healing of traumatic TM perforations. This study was conducted in Department of Otorhinolaryngology and Head Neck Surgery, Government medical college Srinagar Jammu and Kashmir India from may 2011 to december 2011 and was approved by institutional ethics committee. Seventy three patients of age group 20-35 having traumatic TM perforation and presented in our clinic within one week after injury where enrolled. All patients were enrolled and were mentally capable of adhering to the protocol and providing the relevant study information for whole study period. All patients were informed about the procedure of the study and written consent was obtained from them. Patients, who met the inclusion criteria that included traumatic perforation in pars tensa of TM and having conductive hearing loss of 10-40dB was randomly allocated to receive either topical heparin in dose of 250iu per day, in addition to systemic antibiotics and nasal decongestants or systemic antibiotics and nasal decongestants only. Exclusion criteria was any contraindication to topical heparin, any element of sensorineural hearing lose, any element of ossicular discontinuity and any other otolaryngological problem. At the first visit, a thorough and detailed history of present and past medical illness, past H/O anesthetic exposure, routine investigations including coagulation profile and audiogram were done. General and systemic examinations including otolaryngologic examination of all the patients were done. After the completion of examination and investigations, the patients were randomized to receive either heparin or no heparin (control) treatment. The randomization was allocated by random number table, use by the even and odd numbers in equal proportions. The even numbers in random number table represented the control group, while the odd numbers represented the study group. We studied 73 patients with age group 20-35 having traumatic TM perforation due to various causes, these patients were put in two groups, control group which contained 36 patients and study group which contained 37 patients. Control group patients were treated with systemic antibiotics and nasal decongestants whereas study group patients were treated in addition to systemic antibiotics and nasal decongestants by topical heparin. Day of presenting in clinic after trauma and number of patients in both groups is given in [Table 1]. 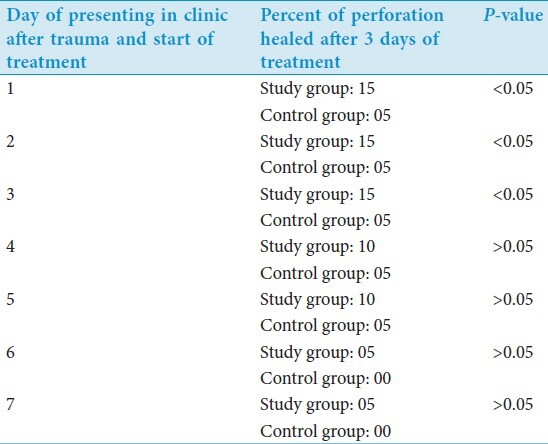 Percentage of healing done after 3 days of treatment in both groups is compared in [Table 2]. Percentage of healing done after 7 days of treatment in both groups is compared in [Table 3]. Percentage of healing done after 14 days of treatment in both groups is compared in [Table 4]. 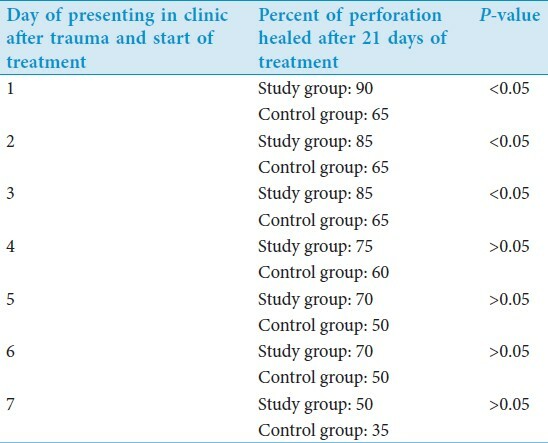 Percentage of healing done after 21 days of treatment in both groups is compared in [Table 5]. Traumatic TM perforations may arise from instruments such as cotton swabs, bobby pins, and sticks, skull fractures, acid burns and welding or metal working slag burns. Pressure induced perforations can occur after loud noise and explosions, open palm trauma (slapping), or changes in ambient pressure that occur during flying and underwater diving, increased pressure (from airplane descent and underwater diving) causes ambient pressure to become greater than that of the middle ear. If the eustation tube does not equalize this pressure, TM may bulge inwards and rupture. Iatrogenic causes during medical care, such as in expertly performed irrigation of ear canal for removal of wax, ventilating tube insertion and emergency myringotomy. Patients with traumatic TM perforation present with pain, bleeding or discharge, tinnitus and hearing loss. When there is hearing loss size of perforation, generally correlate with amount of hearing loss, but location is also a factor. Severe hearing loss may result if significant trauma disrupt the ossicles or injure the inner ear. In case of traumatic perforation some observation time is recommended before surgical intervention. Surgery may consist of simple procedure of fat plugging, which has a limited success rate or regular middle ear surgery, which still has some percentage of failure and has some risk of complications. The healing of TM is not similar to that of other cutanious structures. Immediately after trauma the squamous epithelium at the edge of perforation become hyperplastic and produce excessive keratin (Stensor et al. 1980). These proliferative epithelial cells along with keratin, first try to cover the wound. The epidermis close to perforation in the direction of surface migration. Secondarily, fibrous reaction takes place and in growing connective tissue laid down beneath the epithelial covering (Johnson et al. 1990). The closure of connective tissue defect is always preceded by the healing of epithelial layer. This mechanism differs from the normal healing process of other cutaneous wounds were the squamous epithelium migrates over the newly formed granulation tissue (Boedts and Ars 1977). In the recent years, various substances like hyaluronic acid (Chauvin et al. 1999), growth factors (Ma et al. 2002), pentoxyfyline (lim AA 2000) and heparin (Helstrome and Spandow 1994) were used for treating TM perforations. Wound healing requires precise coordination of epithelialization, dermal repair and angiogenesis (Singer and Clark, 1999). Epithelialization is ultimately dependent on the migratory, proliferative and differentiation abilities of keratinocytes. The growth and differentiation of keratinocytes are regulated mainly by a variety of growth factors (Hashimoto, 2000), of which the members of the epidermal growth factor (EGF) family are the most important for wound healing. The EGF family consists of EGF, transforming growth factor(TGF)-α, heparin binding EGF-like growth factor (HB-EGF), amphiregulin (AR), epiregulin (EPR), betacellulin (BTC), epigen and neuregulin (NRG)-1, NRG-2, NRG-3 and NRG-4(Falls, 2003; Harari et al. , 1999). The EGF receptor (EGFR) family consists of EGFR (also called ErbB1), ErbB2, ErbB3 and ErbB4 (Jorissen et al., 2003). The mammalian ligands that bind EGFR include EGF, HB-EGF, TGF-α, AR, BTC, EPR and epigen. In this study, we study the role of topical heparin in healing of traumatic TM perforations as heparin is one of the important factors in healing (HB-EGF). In our study, we studied 73 patients of age group 20-35 having traumatic TM perforations due to various injuries and present to our clinic within one week after injury. These patients were put in two groups, control group contain 36 patients and study group contain 37 patients. Control group patients were treated with systemic antibiotics and nasal decongestants whereas study group patients were treated in addition to systemic antibiotics and nasal decongestants by topical heparin. Follow-up was done for period of 21 days. In our study, there was statistically significant (P<0.05) improvement in spead of healing in study group after 3, 7, 14 and 21 days of treatment when treatment was started within 3 days of trauma. There was improvement in speed of healing when treatment was started after 3 days of trauma but that was not statistically significant (P>0.05). Large randomized controlled studies are needed to study the effect of topical heparin in healing of traumatic TM perforation, but this study shows statistically significant role of topical heparin in improvement of speed of healing in traumatic TM perforation when topical heparin was started within 3 days of injury. Therefore, the use of topical heparin should be further promoted and implemented as routine use in traumatic TM perforations, whenever there is no contraindication for its use. 1. Chaurin K, Bratton C, Parkins C. Healing large tympanic membrane perforation using hyaluronic acid, basic fibroblast growth factot and epidermal growth factor. Otolaryngol Head Neck Surgery 1999;121:43-7. 2. Helstrom S, Spandow O. Exogenous heparine, topically applied aids in remodeling of connective tissue in healing of experimental tympanic membrane perforation. ORL J Otorhinolaryngol Relat Spec 1994;56:45-50. 3. Lim AA, Washington AP, Greinwald JH, Lassen LF, Holtel MR. Effect of pentoxyfyline in healing of guinea pig tympanic membrane. Ann Otol Rhinol Laryngol 2000;109:262-6. 4. Ma Y, Zhao H, Zhou X. Topical treatment with growth factors for tympanic membrane perforations Acta Otolaryngol 2002;122:586-99. 5. Coffey RJ Jr, Derynck R, Wilcox JN, Bringman TS, Goustin AS, Moses HL, et al. Production and autoinduction of transforming growth factor-alpha in human keratinocytes. Nature 1987;328:817-20. 6. Cook PW, Mattox PA, Keeble WW, Pittelkow MR, Plowman GD, Shoyab M, et al. A heparin sulfate-regulated human keratinocyte autocrine factor is similar or identical to amphiregulin. Mol Cell Biol 1991;11:2547-57. 7. Cribbs RK, Luquette MH, Besner GE. Acceleration of partial-thickness burn wound healing with topical application of heparin binding EGF-like growth factor (HB-EGF). J Burn Care Rehabil 1998;19:95-101. 8. Cribbs RK, Harding PA, Luquette MH, Besner GE. Endogenous production of heparin-binding EGF-like growth factor during murine partial-thickness burn wound healing. J Burn Care Rehabil 2002;23:116-25. 9. D'Souza SJ, Vespa A, Murkherjee S, Maher A, Pajak A, Dagnino L. E2F-1 is essential for normal epidermal wound repair. J Biol Chem 2002;277:10626-32. 10. Erickson SL, O'Shea KS, Ghaboosi N, Loverro L, Frantz G, Bauer M, et al. ErbB3 is required for normal cerebellar and cardiac development: a comparison with ErbB2-andheregulin-deficient mice. Development 1997;124:4999-5011. 11. Sibilia M, Wagner EF. Strain-dependent epithelial defects in mice lacking the EGF receptor. Science 1995;269:234-8. 12. Singer AJ, Clark RA. Cutaneous wound healing. New Engl J Med 1999;341:738-46. 13. Stoll S, Garner W, Elder J. Heparin-binding ligands mediate autocrine epidermal growth factor receptor activation In skin organ culture. J Clin Invest 1997;100:1271-81. 14. Takeda J, Sano S, Tarutani M, Umeda J, Kondoh G. Conditional gene targeting and its application in the skin. J Dermatol Sci 2000;23:147-54. 15. Casu B. Structure of heparin and heparin fragments. Ann N Y Acad Sci 1989;556:1-17. 16. Hirsh J. Heparin. N Engl J Med 1991;324:1565-74. 17. Weitz JI. Low-molecular-weight heparins. N Engl J Med 1997;337:688-98. 18. de Kort M, Buijsman RC, van Boeckel CA. Synthetic heparin derivatives as new anticoagulant drugs. Drug Discov Today 2005;10:769-79. 19. Tyrrell DJ, Horne AP, Holme KR, Preuss JM, Page CP. Heparin in inflammation: potential therapeutic applications beyond anticoagulation. Adv Pharmacol 1999;46:151-208. 20. Lee AY, Rickles FR, Julian JA, Gent M, Baker RI, Bowden C, et al. Randomized comparison of low molecular weight heparin and coumarin derivatives on the survival of patients with cancer and venous thromboembolism. J Clin Oncol 2005;23:2123-9. 21. Elsayed E, Becker RC. The impact of heparin compounds on cellular inflammatory responses: a construct for future investigation and pharmaceutical development. J Thromb Thrombolysis 2003;15:11-8. 22. Peplow PV. Glycosaminoglycan: a candidate to stimulate the repair of chronic wounds. Thromb Haemost 2005;94:4-16. 23. Wang J, Zheng H, Qiu X, Kulkarni A, Fink LM, Hauer-Jensen M. Modulation of the intestinal response to ionizing radiation by anticoagulant and non-anticoagulant heparins. Thromb Haemost 2005;94:1054-9.